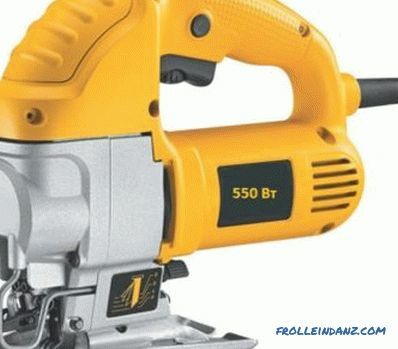 In order to facilitate the work with wooden products, it is best to use electric tools such as jigsaw, plane, drill and others. A special feature of the electroplane is that it is not only reliable and easy to use, but it can be used to perform work that was previously done only on a woodworking machine. 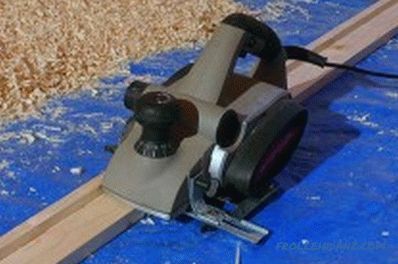 Another advantage that leads to the purchase of such a tool is that a raw board is much cheaper than a treated board, and you can save significant funds on the purchase of material for work. Electric jigsaw - in it there is a translational movement of the working tool, in the electroplaning it has a rotational movement. In order to obtain a high-quality surface, the engine in the specified tool must have a power of at least 600-900 W, and the speed of rotation of the knives - up to 10,000 rpm. In order to ensure the replacement of the belt, through which the rotation is transmitted from the engine to the knives, it is located on the side and under the removable casing. To ensure quick replacement of brushes, there is another removable cover. To protect the motor against overload, the rotational speed increases smoothly and is kept at a constant level. The principle of the electroplaning. The sole is cast from a material such as aluminum and consists of 2 parts. 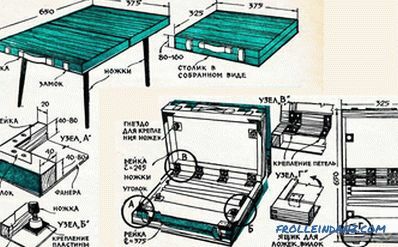 The back of it is stationary, it moves on the treated surface, and the front can be adjustable in height and moves through untreated wood. To adjust the depth of cut, use the knob or button with graduations. In order for the work to be done qualitatively, it is necessary to move the tool at a constant speed. 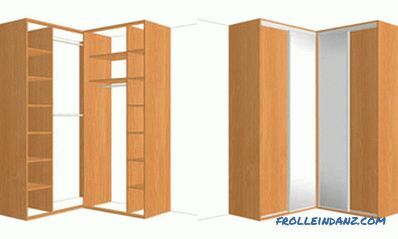 Having a side stopper helps you choose a quarter of the required width without much physical effort. The casing above the drum can be hinged, it rises only when necessary to choose a quarter. The power of such a tool can be in the range from 0.5 to 2.2 kW. If you are planning to do one-time work around the house, then a model with a power of up to 0.6 kW will suffice, if you do this work often, then you need to acquire a plane with a capacity of up to 0.9 kW. Tools with a capacity of more than 1 kW are already considered professional and are not usually used for domestic needs. 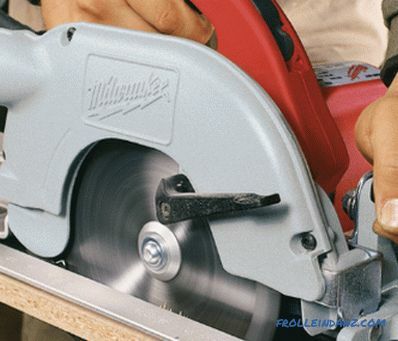 When choosing an electric planer, you need to pay attention to the sole, which should be smooth, since it depends on how smooth the obtained surface will be. The main working element is a rotating drum on which the knives are located. In a plane, often the rotation of the shaft can reach 12-18 thousand revolutions, for comparison - in the Bulgarian it is about 11 thousand revolutions. 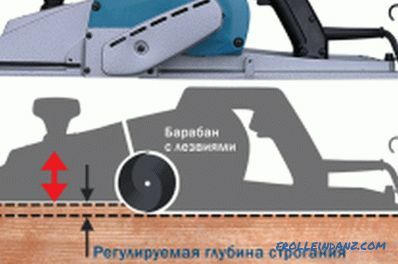 If the rotation speed of the drum, in which 2 knives are installed, is 15 thousand revolutions, then in one pass you will do the work that you could do in 30 thousand passes with a hand plane. Most models can be planed to a width of 82 and 110 mm, the larger this figure, the fewer passes need to be made in order to process the entire part. In most household models, it is possible to control the depth of planing within 2 mm, and for professional models up to 4 mm in increments of 0.1 mm. 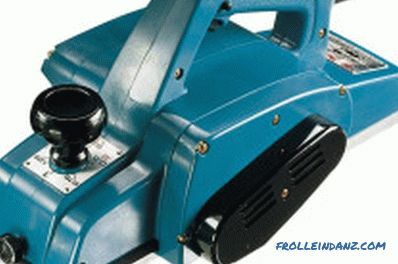 If we talk about the weight of the electric planer, it can vary from 2.5 to 9 kg. A planer weighing 3.2-4 kg will suffice for use at home. When choosing a power tool, regardless of whether it is a jigsaw or a plane, you need to pay attention to certain of its parameters that affect the quality and safety of work. 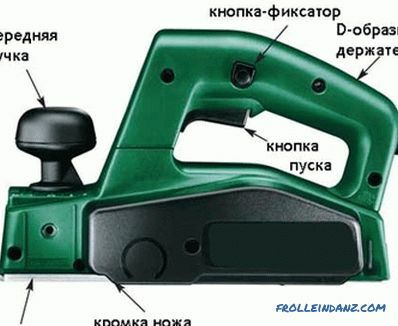 It is better to choose an electric planer with two handles, since the second handle when working helps to push the tool. Choice of a sole. This part of the tool should be very smooth, so that the quality of work performance is high. During operation of the tool, an air cushion is obtained, which makes it impossible to perform a uniform cut. To avoid this, make the soles with grooves. To remove corners or chamfers, a v-shaped right-angle cutout is made on the front of the sole. The height of the sole in its front can be adjusted in the vertical direction, and in such models as RYOBI, METABO, AEG, also diagonally, which is a more convenient option. Regardless of the height of the sole of the knife, it is at the same distance, so the cut is smooth. Tool stability depends on the size of the sole: the larger they are, the more stable the electric planer will be. Handle selection. To make it easier to control the specified tool, there must be 2 handles.With the help of the one located at the back, you can push the tool, there is also the start button, and with the help of the front, the tool moves and the work is carried out with a sweep. To remove a thick layer, it is necessary to push the front handle with considerable effort. Often, a second handle is used to regulate the thickness of the wood being cut. To prevent accidental switching during operation, special notches are made inside it. In electric planes such as MAKITA, there are no notches on the handle, and the chip thickness can be adjusted directly during operation. But it is suitable for professionals, but for the amateur this option is better not to choose. Usually, the adjustment step is 0.1 mm, but for manufacturers such as SKILL, PEUGOT or BOSH, even when set to "0", chips are removed. It is better to choose models where the scale starts below zero, these are manufacturers such as RYOBI, MAKITA, BLACK. DECKER or AEG, FESTO. Knife selection. If the jigsaw has a working tool in the form of a saw, then the planer has knives. Usually it is 2 bilateral knives. Knives can be made of carbide and tungsten or steel, which has been hardened, they can be eroded. On the FESTO models one knife is installed, it is located obliquely and makes it possible to make a spiral cut. You can perform work with such a tool more quickly and efficiently. If the knife is a carbide knife, then it is easier to install into place, when installing sharpened steel knives, you need to be more careful, you need to level them well. To replace the spiral knife you need to spend only a few seconds. To protect your hands, two devices are used, which are located on the side and bottom. 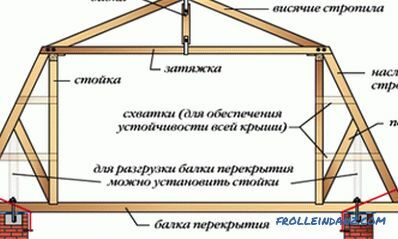 In models such as METABO, BLACK. DECKER, FESTO or BOSH, there is a stop that is ejected automatically when lifting the back of the sole. In SKILL or AEG, the drum is completely closed by a folding cover, it rises automatically or by means of a lever. After completion of the work, the tool must be placed on the side where the drive belt is located. On the side is a protective spring, it rises to the height of the produced quarter. When buying an electroplaner, it is better to choose the model that has the ability to direct the ejection socket shavings. So that the electroplane does not get clogged with chips during operation, it is thrown out of it, but at the same time it scatters around the room. To prevent this from happening, you need to use a socket that will help eject the shavings sent. There is an option when a bag is used to collect chips, but it should be small and not interfere with work. To completely get rid of chips, you can attach a vacuum cleaner, which option to choose - you decide. In order to accurately set the required width and depth of chips, it is necessary to use a depth gauge and a side stop. If it is necessary to process thin edges, the lateral limiter effectively helps, both of these accessories must be in the electroplaning design. 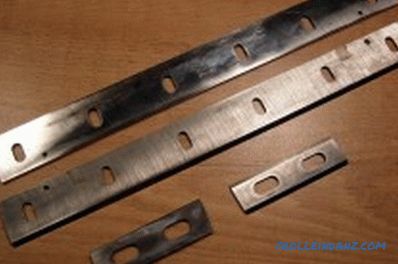 For roughing, wavy knives made of hardened steel can be used. If you use equipment that allows you to fix the plane, then it turns into a woodworking machine. By the number of knives, electric planers are bilobacter and one-knife. Dual-pliers work only with precise alignment, and single-paws are simpler and more productive. Both when working with a jigsaw and when working with an electric planer, the tool plays an important role in making the tool comfortable. Not only the accuracy of the movements will depend on the inclination of the handle, but also the force applied during operation. The presence on the handle of the control key allows you to operate the tool even with one hand, you can always turn it off at the right time. If you often plan to work on a large scale, then you should choose relatively lightweight models. To be able to work freely with a plane, the length of the power cord should be sufficient for your premises. 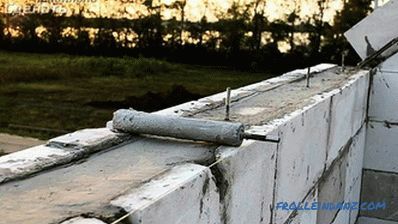 The treated surface should be as smooth as possible, but this does not always work. A wavy surface is often obtained when straight knives are installed in the plane. It all depends on how well they are set in height, but this problem is eliminated if you use a spiral knife. 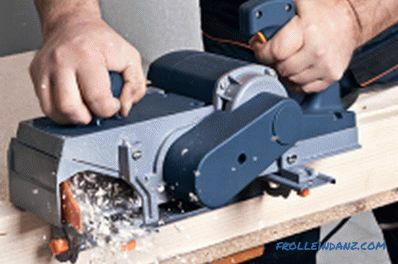 Choosing the right electric planer is quite difficult, but by following these recommendations, you can do it yourself. How to choose the right jigsaw for home? Help in choosing a jigsaw: how to choose the right one. What to look for when choosing a tool for the home. Selection of a suitable engine power. 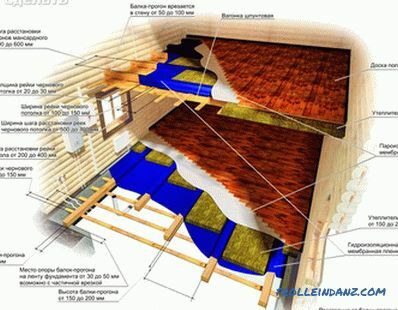 The choice of material manufacturing soles fretsaw.